The past week was surprisingly exhausting for me. It started when I failed to foresee some overtime work. A freelance work forced me to work on a tight deadline. And somewhere along the way, some grown up concerns made its presence. I was doing fine on Monday. Tuesday was manageable. Wednesday marked the start of everything. I have less than 5 hours of sleep. I rendered overtime on the succeeding days. By Friday night, I felt all the exhaustion and sleepiness. I slept on the way home and almost missed my last stop. On weekends, all I did is sleep. I spent more than 10 hours in bed for two days. I felt a little recharged, but not my lousy and obese weight. I badly needed exercise. For the nth time, I hope to return to my exercise routine. Those who have been reading my blog know how much I love handwritten notes, letters to postcards. For a while, I thought I outgrew this interest. It started when email, Friendster (back then), Facebook and all other social media channels entered my life. When I started working, this old school way of communicating found its way on me again. And much to my surprise, I started to gain friends through this medium. Most of them started as blog friends and later, became letter-writing / penfriends. The opportunities for friendship even extended in my Instagram account. I found readers / followers / post crossing friends and acquaintances. Please keep them coming! While not everyone maybe interested in stamps, mail and letter writing, I always welcome new friendships, albeit online. Everyday's wardrobe theme - The only thing I love about summer is the opportunity to wear my own clothes ... not my office uniform. Some things just don't change. It has always been shades of blue with my clothes. 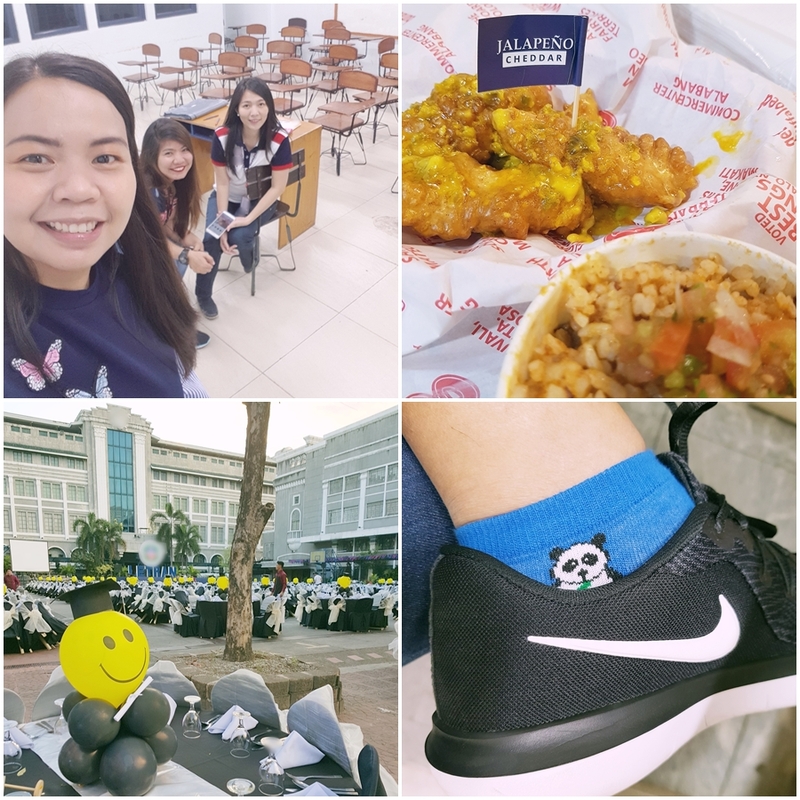 And these sum up the past week - Selfie with my friends after our overtime work, super late dinner with my friend after an exhausting Friday, graduation dinner set up for Batch 2018 and my rekindled loved with sneakers :) This is quite frightening because my shoe preferences seem to shift to something more expensive. These days, it has always been my pair of white Keds or this running shoes from Nike. Although admittedly, there are two reasons why I suddenly become hooked with sneakers. One is because of my favorite Korean actresses. Through their Instagram accounts, I noticed that most of them wear sneakers during work or on regular days. Second is because of my crush, Ho-Pin Tung, who is really the sneaker head. ;) (maisingit lang hahahahaha) I have this tendency to copy or follow the fashion style of the people I like. So yes, this addiction seemed to have a shallow basis at all. In a few more hours, I'm back to work again. I planned to exercise before going to sleep. I'm still wide awake because of all the sleeping I've done the past two days. :p Wishing everyone a great week ahead! Sinong fave Korean actress mo na mahilig sa sneakers? Impossible namang si Kim Tae-hee. Hehe. Uggghhh, tell me about overtime work. Last week was probably one of the most stressful ones I've had in the office at mukhang may spill-over pa this week. Si Yan Jin Sung ang madalas, tapos pati si Shin Hye-sun :) Si Kim Tae Hee may instances, pero d kasing dalas nung dalawa. Love your work clothes! My work clothes is 70% color blue as well. There's just something about the color that associates with professionalism to me. You're so hardworking Diane. I cant imagine working full-time and having a freelance job. Pag uwi ko sa bahay wala na, nasa kama na lang ako. And grabe your work clothes, ang gaganda :) I also have a feeling we have the same Nike sneakers.